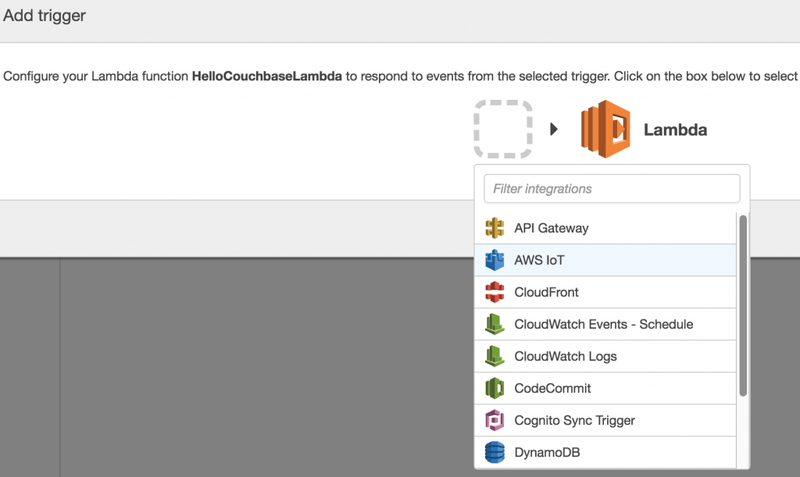 AWS Iot button click will invoke HelloCouchbaseLambda Lambda function. This function is uses Couchbase Java SDK to create a JSON document in Couchbase. More details about configuring IoT Button using mobile app. Here are some snapshots from configuring button using the mobile app. After this, the button is configured and ready to use. This blog skipped the part where a template Lambda Function is associated with the button click. If mobile app cannot be used then the button can be configured manually. Lambda Function can be triggered by several events. Lambda Function is invoked when any of these events occur. By default, no triggers are associated with a Lambda Function. For our HelloCouchbaseLambda function, these can be seen at us-west-2.console.aws.amazon.com/lambda/home?region=us-west-2#/functions/HelloCouchbaseLambda?tab=triggers. How are you going to take AWS IoT button and use it with Lambda and Couchbase? Let us know at Couchbase Forums. Hello… I have one question, I want to know.. is it possible to register IoT with out having aws logins is it possible? with out access i want to register the iot and give to cutomers.. so if they have it they can just useit.. instead of adding trigger to lambda function.. any suggestions.